Firstly, make sure that the schools you are considering are accredited by either the Commission on Collegiate Nursing Education (CCNE) or the National League for Nursing Accreditation Commission (NLNAC). In fact if any of your possible programs are accredited by both, you should give them priority in your preference. How to become a nurse in California? It's important to consider only accredited California nursing programs because it might prove difficult to continue on in your education or your career if the credits you've earned, courses you've completed or experience you've accrued are not recognized. Accreditation bodies review the curriculum, policies, instructors, finances and other important aspects of California nursing programs. Certification by them is taken seriously in nearly every occupational and educational field. Other concerns are the more obvious ones in choosing any school. Does your intended program offer a range of courses that both interest you and further your career goals? Is the location of the school convenient enough, and will the course schedules work with the rest of your responsibilities (work, family, etc)? Is tuition reasonable, and will there be adequate financial aid options? Finally, consider your prospective school's pass rate for the National Council Licensure Examination (NCLEX). If you don't pass the NCLEX, you cannot become a nurse! You'll want to choose a school that has an excellent record of their students passing the NCLEX. Anything less would be a serious red flag. By measuring your possible California nursing programs by this and the above criteria, you should be able to find a solid school and achieve your dreams of becoming whatever kind of nurse you most desire. How much do nurses make in California? Registered nurses (RNs) earn the most in California than in any other state. According to statistics, RNs in California earn 42% more than RNs in the rest of the country. 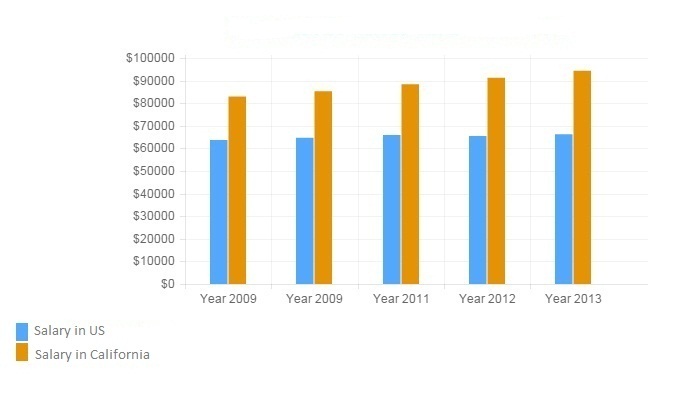 From 2009-2013, median annual wages for RNs increased by 4% nationally, while in California, they increased by 14%. Q:What are the career prospects after completing California State Nursing Programs? A:If you have completed the California state nursing programs and also passed the NCLEX-RN then you may apply for an entry level RN position. According to the US Bureau of Labor Statistics, RNs had an annual median wage of $65,470 in May 2012 while the expected job growth from 2012 to 2022 is 19%. Q:How much does a cna make in California?